The main entrance of the house opened onto Cardo II (not uncovered); today one enters either through an opening made by the Bourbons in the north wall of the atrium of the adjacent House of Aristides, or through its secondary entrance at n. 2 along Cardo III. The name comes from the painting, no longer present, depicting Argus guarding Io, the nymph beloved by Zeus and turned into a heifer. 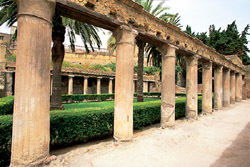 Onto the large three-armed peristyle with stuccoed columns open the triclinium and other residential rooms and, on the western side, the passage through a second, smaller peristyle, whose columns are partly visible through the partially reopened Bourbon tunnels. The upper floor, lost after the open-air digs were abandoned in 1875, had small rooms used as a warehouse and facing the porticoed garden: here the excavators found an actual pantry, with flower and loaves ready to bake, as well as terra-cotta jars containing spelt, legumes, olives, almonds, and fruit.